Business Continuity Management Professionals have a new tool to help understand and manage the challenge of Climate Change. 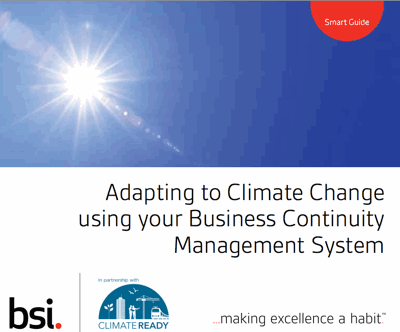 “Adapting to Climate Change using your Business Continuity Management System” is a new publication developed by the Environment Agency in partnership with Climate Ready and that has been published by the BSI. It provides practical advice, developed with input from industry and based on recommendations from the Continuity Forum that will help organisations of all types and sizes better manage Extreme Weather Risk. The Smart Guide can also help improve the support and development of wider Climate Adaption Programmes. The Guide has been carefully written to complement the International Standard ISO 22301:2012 for Business Continuity Management and can easily be embedded into your current BCMS. One of the biggest benefits to be gained is in the area of communication and engagement. By clearly laying out the issues and associated actions needed, the organisation can communicate both internally and externally on the management of risks from severe weather, and develop an integrated approach to climate change adaptation that benefits all its stakeholders. Get involved & act now! Climate Change is a truly global challenge with huge implications for us all. Around the world business & communities are having to come to terms with the effects and we all need to learn to adapt to its effects. Business Continuity & Risk professionals have a vital role to perform for their organisations and communities. Most will already have experienced the impact of extreme weather and had to manage the disruption caused. When it comes to coping with real impact of Climate Change Business Continuity and Risk Management are right in the front line. This 'Smart Guide' provides BCM and Risk Professional with practical 'good practice' help that directly addresses many of the most common issues identified in more than three years of research by the Continuity Forum. The guide can easily be applied to your current planning and fits perfectly with ISO22301. It'll help build not just the quality of your planning, but the quality of your business too!. Act now, download the guide, review your planning and start adapting to the challenge. While BC is used as a starting point, the guide also offers BC managers a route to develop a comprehensive approach to managing climate risks across the organization, looking for innovation and opportunity, as well as more effectively managing the potential negative impacts. The production of this FREE Smart Guide was one of the recommendations made to the Environment Agency following nearly three years of Continuity Forum research into Extreme Weather and Climate Adaptation that had a a specific focus on how these global issues will impact on our professions. A key part of our ongoing work is to build the understanding on how the BC and Risk Management sectors are addressing ‘Climate’ effects in their current planning, and how our sectors’ skills and experience can positively contribute to improvements in the development of better Climate Adaptation programmes. Over the past two years, over 1500 professionals from across the Risk and Business Continuity sectors attended events and workshops with a further 3,700 participating in various internet based surveys. This is undoubtedly one of the largest research projects ever undertaken in our sector. In a connected CAP programme last year, further research was developed specifically for the Environment Agency. We will be publishing more information on these activities and our findings shortly. Our research though currently shows a very mixed picture. While awareness of weather risk was generally perceived as high, further investigation showed practical action to improve planning and capability was fragmented and limited in scope, often due to budget constraints, but also due to a widely admitted lack of focus. As an example, while most BCM plans do have some kind of reference to weather events, plans frequently did not have the the depth or scope to fully appreciate the financial or operational effects consequences of the increasing frequency of Extreme Weather. A common issue observed affected the Risk Assessment and Business Impact Analysis that was often based on limited or flawed data that simply underestimated the threat and consequently the impact/costs. In more detailed questioning of BC and Risk Management professionals, it became apparent that often their internal structures played a significant part in the issues being faced. In larger organisations, Climate Adaptation is often managed within Environmental Services and this focus introduced a bias in planning that meant in too many instances the skills of BCM and Risk Professionals were being separated from the information and activities being undertaken. This directly affected the engagement opportunities for our sector, even though a minority reported that there were some liaison meetings between the groups. If you would like more information on our work connecting Climate Adaptation, Risk and Business Continuity Management or find out how we can help your organisation please get in touch HERE!